The earlier you buy disability insurance, the lower your premium rates will be, and you lock in those rates for life. Disability insurance insures your income against the possibility that you’ll become so disabled that you can’t work anymore. When you have disability insurance and suffer a disability that forces you to leave your job, the disability insurance company pays you a monthly benefit for a predefined number of years or until you recover. Disability insurance benefits are meant to help you pay your rent or mortgage and keep food on the table when you’d otherwise struggle to pay your bills. Disability insurance benefits should replace about 60% to 80% of your pretax wages, roughly equivalent to your take-home pay. (Disability insurance benefits are not taxed if you pay your premiums with your after-tax dollars.) For that level coverage, you can expect to pay between 1% and 3% of your income in premiums. The earlier you buy disability insurance, the lower your premium rates will be. That’s because as you age, your health declines and you become more likely to suffer a disability or illness. However, most disability insurance carriers allow you to lock in your rates, so if you purchase disability insurance when you’re healthy, you’ll still get to pay the same rates when you’re older and potentially less healthy. For example, a 24-year-old man who needs a $5,000 monthly benefit that lasts until he retires can expect to pay about $1,028.72 per year, but, all else being equal, he’ll pay about $1,539.44 per year for that same coverage if he buys the policy at age 40. What determines my premium rates? How do I lock in my rates? You keep your disability insurance policy in force by paying your premiums, which are monthly or annual payments made to the insurance company. Your premiums are determined by your personal health background, the amount of coverage you need, and how you qualify for that coverage. The younger you are, the less expensive your premiums will be. That’s because as you grow older, you’re likely to be less healthy and take longer to recover from a disability. You’ll also have higher coverage needs due to earning a higher salary and having more financial responsibilities, like paying a mortgage or raising children. Policygenius makes it easy for people at any age to compare quotes for disability insurance plans until you find one that fits your needs. If you have a chronic illness, or a family history of one, it may be more expensive to get disability insurance because of the increased risk of becoming disabled due to that illness. It may be possible to receive an exclusion for a given illness or disability you already have, which means the condition won’t be factored as much into your premiums but that you’ll also be unable to claim disability insurance benefits if that condition causes your disability. Benefits should roughly equal your take-home pay. If you purchase more coverage, you’re essentially purchasing a larger benefit amount, although disability insurance companies will work with you to make sure you’re not purchasing either too little or too much. Benefits are paid monthly as long as you’re disabled or until the end of the benefit period. The benefit period is the length of time the insurance company is obligated to pay benefits to you in the event that you become disabled. The long-term disability insurance benefit period ranges from two years to age 65 (or age 67, depending on the carrier), and you can save on premiums if you choose a shorter benefit period, but it might not provide enough coverage for you if your disability lasts many years. Every disability insurance policy has an elimination period, which is the length of time after becoming disabled that you have to wait until the carrier begins paying benefits. This allows the carrier to monitor your health in case you recover and can go back to work before it starts paying benefits to you. Shorter elimination periods – meaning that you can get paid sooner – mean higher premiums and may be prohibitively expensive. The most cost-effective elimination period is 90 days. Disability insurance companies typically offer one of two main definitions of disability, which is the metric they use to confirm that you’re eligible to receive benefits. Own-occupation disability insurance is the more expensive of the two, because it means you only have to be so disabled that you can’t work at your current job, but if you can earn an income doing something else then you’re still eligible for benefits. A typical example is the surgeon who can no longer perform surgeries but can still teach medicine at a university. Any-occupation disability insurance may let you save on your premiums, but it makes it much harder to qualify for benefits when you become disabled, because you have to be so disabled that you can’t work any job. In the example of the surgeon-turned-lecturer above, having the physical ability to teach medicine would invalidate his or her eligible for benefits. To make sure your rates stay the same as you age and become less healthy, you need to lock in your rates. You can do this by purchasing a non-cancelable rider, which guarantees your rates on the policy as long as you keep paying the premiums, and a guaranteed-renewable rider, which means the carrier also can’t cancel or change the policy itself. Riders are additional coverage that enhance the terms and provisions of your base disability insurance policy. Some may be added at no additional cost, but others will increase your premiums. If you’re buying disability insurance, you should also consider getting a residual benefits rider, which pays partial benefits if your disability has reduced your income but you’re still able to work. If you expect your income to increase later in life, you may also want to purchase a long-term disability insurance future benefit increase rider. This additional coverage will raise your premiums, but it will make sure that your benefit amount equals what you earn when you become disabled, not what you earned when you bought the policy years ago. Men pay less than women for disability insurance, because more women file claims for pregnancy and mental health conditions. However, disability insurance rates increase at a faster rate for men than for women, with men paying about 50% higher rates at age 40 and 191% higher rates at age 60 than they would at age 24. On average, women pay more than men disability insurance coverage. Although that may seem unfair, disability insurance companies have looked at general statistics for claims and determined that women are disabled for longer periods of time or undergo a disabling condition more frequently than men. Fortunately, premiums rates increase slower for women than men, with women paying about 35% higher rates at age 40 and 102% higher rates at age 60 than they would at age 24. Every carrier has its own premium terms for treating transgender and gender-nonconforming people. Depending on the carrier, your premiums may be priced based on your gender assigned at birth even if it differs from your actual gender identity. Not only is this disparaging, it also has significant consequences for the premiums you pay for disability insurance at any age. If your carrier refuses to process your application under your gender identity, you should shop around for a carrier that correctly genders you when determining your rates. While you should never purchase an insurance policy that doesn’t fit into your personal budget, there are financial advantages to purchasing earlier in life, even if you don’t think you need it just yet. Not only do you save on premiums, you also gain financial leverage. Financial leverage is the value you attain from your premiums if you become disabled at an earlier age over what you’d gain becoming disabled at a later age. We calculate financial leverage using the assumption that your disability will last the entire benefit period. For example, if you’re the woman in the above rate table, you’re paying $1,825.60 per year from age 24 for disability insurance coverage. If you become disabled at age 24, and your disability is so severe that you remain disabled until the end of the benefit period (age 65, a span of 41 years), your $5,000 monthly benefit will result in a total lifetime benefit of $2,460,000. Your financial leverage is 1,347.50, meaning your $1,825.60 premium has been multiplied 1,347.50 times. But the older you are when you get disability insurance, the less financial leverage you have. 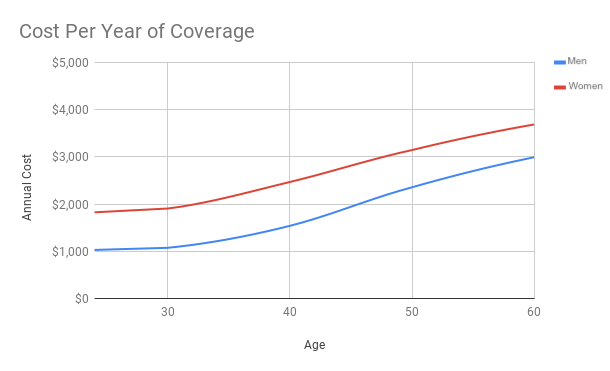 If she purchases coverage for the first time at age 40, she’ll pay $2,467.92 per year for coverage for the same benefit amount. That results in financial leverage of just 607.80.